Legend: The King and his army need new recruits after the Lightbringer War. Talk to King Medivus and ask him to 'join' the Thaian Army. Harkath Bloodblade is located just east of the King's Castle. You must say 'hail general' whenever you great him. He will tell you to go and bring some Bread to Partos in the cells in the south of Thais. You can buy bread from Frodo in the food shop in Thais. Return to Harkath Bloodblade and say mission. Talk to Harkath Bloodblade and ask for a mission. He will tell you to collect his sword from Tim as he lent it to him a few days ago. When you get to Tim, the guard above the Thais east gate, ask him about thesword, he will tell you he lost it in a fight with the trolls on a drunken night. He will tell you to go to Sam the blacksmith in Thais and get a replacement. Head to Sam just south of the north gate and ask him for a replacement, he will tell you he needs the listed items in order to forge a new sword for the General: 7 Pieces of Iron, Wood for a fire, 2 Copper Bars, and a Bucket. Once you have collected all the items, return to Sam to forge the replacement sword. Take the sword back to Harkath Bloodblade to complete the mission. Return to Harkath Bloodblade and ask for a mission. He will tell you he doesn't have anything else for you and to help out the citizens of Thais. You can do them in any order and you can have as many as you want active. Go to Quentin the Temple NPC and ask for a mission. Listen to what he has to say and then head to Lynda the Church NPC and say mission to her as well. Lynda will send you to the King. Ask him for a mission then return to Lynda and say mission again. She sends you back to Quentin. Go to Quentin again and say mission and he'll send you to Benjamin the postman in the depot. Say mission to him. Finally head back to Quentin and say mission one last time to finish this part. Go to Muriel the Sorcerer in the southwest of Thais. Ask him for a mission. He'll ask you to bring him a Scarab Amulet. You will have to either kill Ancient Scarabs to obtain this or buy it from a player. Return to him once you have it and say mission to hand it over and finish this part. Go to Bozo, the King's Jester, found in the courtyard of Thais castle. Ask him for a mission and he'll ask you to bring him an Inkwell and 5 Pieces of Paper. Inkwells can be found spawned in many buildings. Pieces of Paper can be bought from Wally, the postman NPC below Kevin (who gives the Postman quest). The pieces of paper cost 5 gold coins each, however, you will need a high rank in the Postman guild (rank unknown) to be able to buy them. Once you have obtained the items return to Bozo and say mission, yes to hand over the items. Go to Trimegis the wizard shut in the room upstairs above King Medivus. Ask him for a mission and agree to help. You'll be asked to clear the cellar of Spiders. 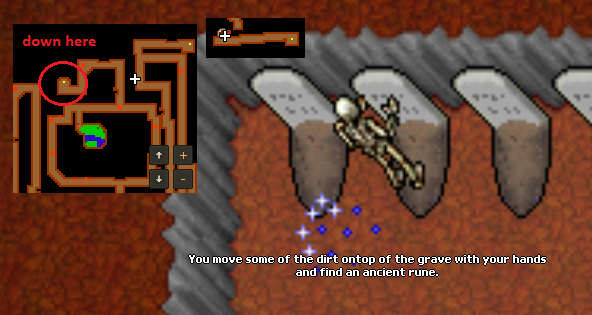 The Spiders are located in the small room underground north of the temple here. 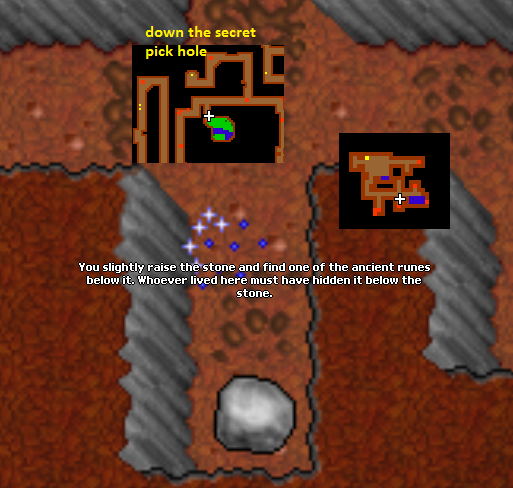 There are only 3 in there and once killed it will say you have completed the task. Return to Trimegis and say mission to complete this part. 4 - Past the Mad Mage Room quest past 3 Cyclopes down a hole in the dead orc body. After collecting all 4 runes return to Harkath and say runes. He'll ask you to give them to Trimegis. 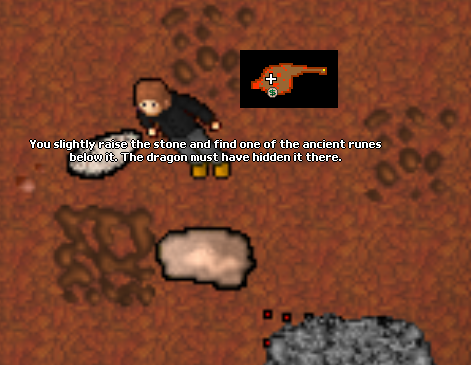 Go to Trimegis and say mission and turn over the runes.. Speak to Harkath again and he will tell you to find and kill Zundram, located under Mt. Sternum. He is in a room with some Demon Skeletons and Crypt Shamblers but is basically a weaker Necromancer. Once you have killed him return to Harkath and turn in your mission, you will receive 10,000 exp as a reward. He will now tell you to ask him about a promotion. At this point, he will tell you a story and welcome you to the army, he will give you a Thaian Soldier Shield. He then suggests you consider seeking out the other factions (Elves, Orcs, Dwarves, and Minotaurs). He basically explains that you can join any faction without shutting yourself off from the Thaian Empire. Talk to Harkath and he will now send you on your first mission as a 'Private' of the Thaian Army. This is a killing mission. He asks you to kill 650 War Wovesl. 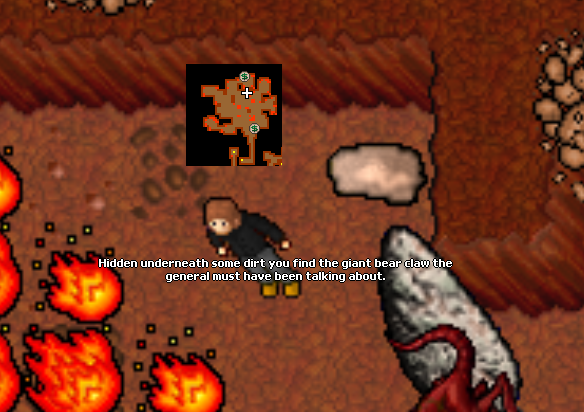 The best spot to do this is the War Wolf cave south of Thais. 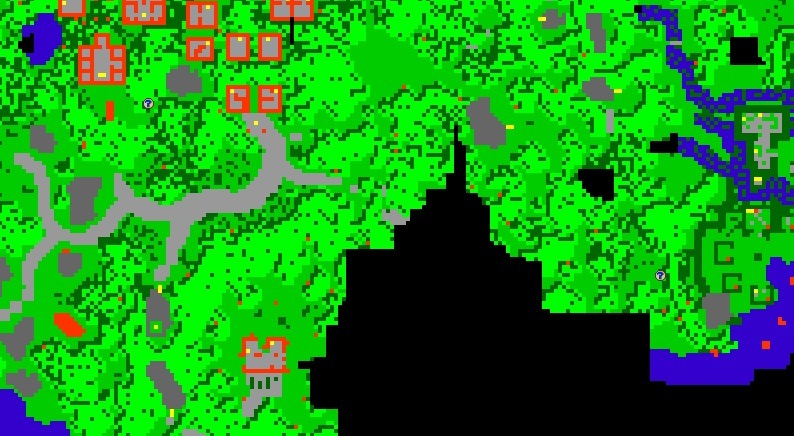 There are 7 on the surface (at the yellow circles), as well as 30 or so in the underground cave itself (red circle). Once done return to him and ask about your mission and you'll receive 20,000 exp as a reward. Ask Harkath for a mission and he'll tell you he is too busy to give you any now and to seek out other NPC's to help. Go to Gamon the furniture NPC east of the windmill in northeast Thais and ask for a mission. He will ask you to find a missing package lost in the swamps. In the room will be 3 Witch and in the south of the 3 boxes is the package. Once you have retrieved it and given it over you will be given 20 Platinum Coins as a reward. Go to Galuna, upstairs in the Thais Scout guild. Ask for a mission and she'll ask you bring her an Elven Bow. You will either need to buy this from a player or loot one from an Elf Arcanist/Elf Scout, however, it is a very rare drop. Once you have the bow give it to her and she will give you 100 Burst Arrors as a reward. Go to Gorn, the NPC that sells equipment such as ropes and shovels in Thais. Ask him for a mission and he'll ask you to bring him an Advanced Pick. You will either need to buy this from a player or have started The Dwarf Faction to be able to buy it for 2000 gold coins from Grazlin in Kazordoon. Return to Harkath and ask for a mission once again. You will now be tasked with killing 50 Alpha Wolves. This is by far the most frustrating mission so far. Alpha Wolves are not like regular monsters. There are (as far as is currently known) only 7 respawns on the map and once killed it takes 2 hours before it spawns again. 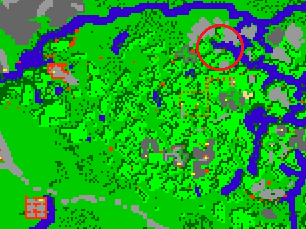 3 south of Thais, 1 on the Surface at the entrance of the War Wolf cave, 1 underground in the southeast area and 1 underground in the northeast area. Return to Harkath once you have killed 50 Alpha Wolves and speak about your mission to receive 20,000 exp as a reward. Ask Harkath for a mission and he will tell you need to complete a mission for him in order to be eligible for a promotion. You will be tasked with collecting a claw from the Thais Dragon Lair. 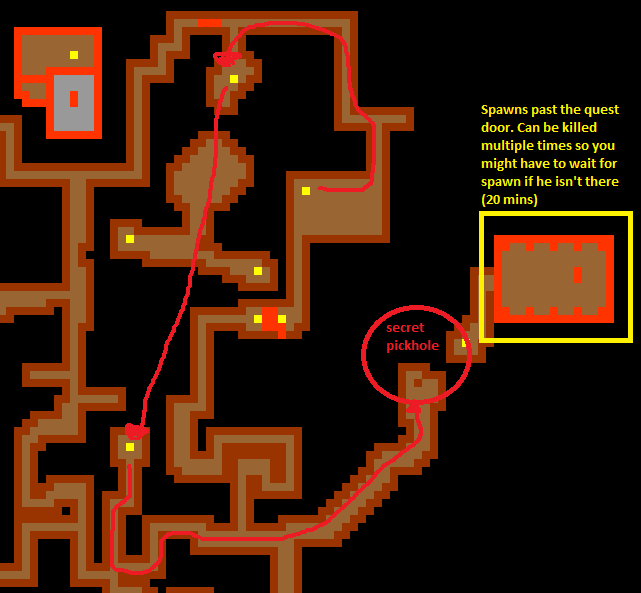 If you are unsure of the route you can find pictures showing the way down in the Naginata Quest page. You only need to go to the main area. The claw itself is located in a rock north from the entry point. Once acquired, hand over the claw to Harkath and speak to him about a promotion. You will now be promoted to the rank of 'Soldier' and be given a Thaian Soldier Armor as your reward. You will now be able to use the Thaian Soldier Outfit. After receiving your promotion you can ask Harkath for another mission and he'll give you your first mission as a soldier of the Thaian Army. You will be tasked with slaying 1,000 Cyclops Warriors. The best location for this is probably the mountain and underground area on the west side of Forgula. Once completed speak to Harkath and you will receive 100,000 experience as a reward. Speak with Harkath and he will tell you to go and help Donald McRonald, Timur, and Tokel. As with mission 3 and 7, each of the NPCs will give you their own little mission to complete and you can have all 3 active at once. Speak with Donald McRonald at the farm in the middle of Thais to start this mission. He will ask you to retrieve a special vial from one of the Thaian Camps and deliver it to Wyda in order for her to make a potion. You will face several Thaian Soldiers and one Royalist in the room marked. You will find the vial in a bookshelf. Deliver the vial to Wyda in Venore. She will ask you to bring her the following ingredients: Green Hair, Brown Hair, Blue Hair, a Pig Tail, a Dog Head and Spiderling Remains, which you will need to buy from players or skin from monsters yourself. After giving her the ingredients, return with the potion to Donald McRonald to complete the mission. Speak with Tokel in Greenshore to start this mission. He will ask you to recover a bottle of wine from a member of his family who happens to be a Lightbringer. Go to the Lightbringer Camp near Garrogat. The bottle is hidden in the caves, be ready to face a lot of Lightbringer Knights and 2 Lightbringer Heroes. After finding the bottle go back and report to Tokel. Speak with Timur in Vilias (Fibula) to start this mission. He will ask you to acquire a bear trap and tells you toget one from Sylvester in Venore. Sylvester is located upstairs in the big building in the southwest corner of the city. Speak to him and he will tell you a rabbit stole his lunch and ask for your help. You will find the lunch in 2 spots in the Venore swamp. One is west of the south Venore entrance, another west of Shadowthorn. then go back and talk to Sylvester and he will tell you it's the wrong one. After that you go to the right mark and do the same thing. Then turn it in to Sylvester. Ask General Harkath about the next mission/promotion/advancement, he will send you to King Medivus. The king will order you to bring him the 5 tomes containing secrets of each race: a Human Tome, an Orcish Tome, a Minotaur Tome, an Elven Tome and a Dwarven Tome. Collect the books and hand them in to the king. Ask NPC Medivus about mission/promotion. He will send you to challenge John, a thaian soldier; he is located in Greenshore Thaian Army Camp. Enter the camp and kill John (he is about as powerful as a regular Thaian Soldier); be ready to face multiple Thaian Soldiers and 1 Royalist on the way. Go back and report the mission to King Medivus. You will be rewarded with 14,000 experience and Thaian Soldier Legs upon completion. Ask the king about an advancement. From now on you will be a 'Sergeant'. You can start a new mission now. He will ask you to find proof of the royalists' betrayal. Go to the Greenshore Thaian Army Camp once again. 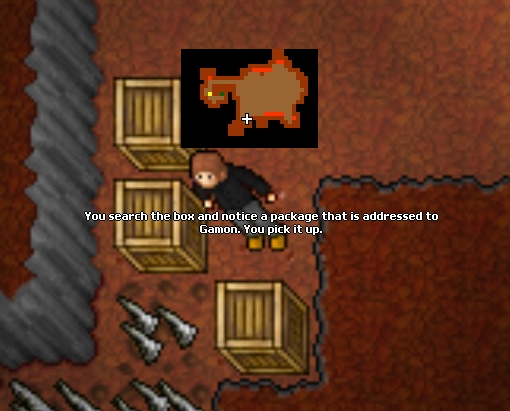 You will find the proof on the -2 floor in a chest behind quest doors; be ready to fight 2-3 Royalists in a narrow corridor. Return back to NPC Medivus and report the mission. 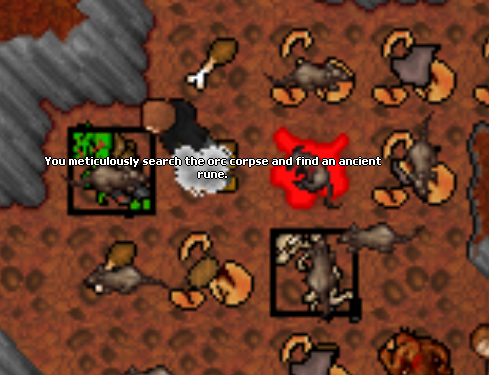 After confirming the betrayal King Medivus will ask you to hunt down 2500 Thaian Soldiers. The best place is probably the Mt. Sternum Thaian Army Camp. Upon completion, you will be rewarded with 400,000 experience and 2 crystal coins. King Medivius will send you to slay 1500 Lightbringer Knight. The best place is probably the Garrogat Lightbringer Camp (or Mintwallin Camp). The reward is 800,000 experience and 3 crystal coins. The next job from the king will be killing 1000 Royalists. The reward is 1 000 000 experience and 5 crystal coins. After proving your strength on the royalist task, the king will send you to murder 250 Lightbringer Hero. The reward is 1 400 000 experience and 5 crystal coins. Once you have murdered the criminals you will be asked by King to gain the trust of every race and wants you to obtain their rings. Having obtained the trust of every faction, the King asks you to get every leader to sign a peace agreement. Afterward, you will receive the title of royalist and be granted the Royalist Outfit and Blessed Amulet as a reward for your deeds. You have officially reached the highest rank within the Thaian army. You no longer have to take orders from anyone. You have finished the Thaian Army Faction. This page was last edited on 14 March 2019, at 20:09.